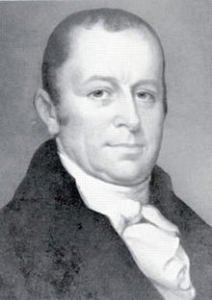 Simon Snyder, for whom Snyder County, Pennsylvania was named was one of Susquehanna River Valley’s most illustrious citizens. He was Pennsylvania’s third governor and a resident of Selinsgrove, Pennsylvania. His 1816 home on Market Street currently houses the Selin’s Grove Brewing Pub. Snyder, who had little formal education and no family political connections rose from obscurity to serve three terms as Governor from 1808-1817. Snyder’s life and times continue to be of interest to local, state and national historians. After Snyder was elected Governor, his portrait was painted by prominent artists Thomas Sully, Jacob Eichholtz, and Charles Willson Peale. Engravings by David Edwin, Cornelius Tiebout and by Samuel Sartain were duplicated in large numbers during his life and even after his death. Peale also painted Elizabeth Michael, Snyder’s first wife, and Eichholtz painted portraits both of Snyder’s second wife, Catherine Antes, and his third wife, Mary Slough Scott. 1759 Born in Lancaster County, November 5, 1759. Snyder’s parents were German immigrants, who came from the Palatinate region. His father was a “mechanic,” a person who labored with his hands, probably a farmer and tanner like Snyder himself. 1774 When he was fifteen his father died and two years later in 1776, Snyder moved to York where he apprenticed with a man who taught him the tanning and currying trades. While in York, Snyder studied reading, writing and mathematics at night with a local Quaker schoolmaster. Beyond this, Snyder was a self taught man with a lifelong habit of study. 1784 Snyder moved to Northumberland County, the Pennsylvania frontier. He found this to be a place of opportunity where he bought land, opened a store and ran a mill in partnership with Anthony Selin, founder of Selins’s Grove. Respected by his fellow citizens for good judgment, honesty and impartiality, Snyder rose rapidly in local politics. Soon after arriving Snyder was elected Justice of the Peace by the freeholders of Penn Township and served for twelve years. 1789 Snyder was elected one of two delegates representing Northumberland County at the constitutional convention in Philadelphia. 1797 Elected to the Pennsylvania House of Representatives and was annually reelected except 1805 when he ran unsuccessfully for governor. He was elected Governor of Pennsylvania three consecutive terms, 1808 by a landslide, 1811, and 1814.War of 1812 Under Snyder’s leadership, Pennsylvania provided men and supplies for the United States’ effort in the second war for American independence against Britain, the War of 1812. 1817 Snyder left office. He returned home to Selinsgrove and his new house on Market Street. A year later , he was elected to the State Senate. He served one year of his term before succumbing to Typhoid on November 9, 1819. In 1881 the Pennsylvania Senate appropriated $3,000 for a monument honoring Gov. Snyder because of his efforts to provide free public schools. He believed democracy could not thrive without an educated citizenry. In 1885, the monument given to the people of Selinsgrove by the State of Pennsylvania was placed over his grave in in the Old Lutheran Cemetery, just off Market Street on Bough. The Quincy Granite Company of Quincy, Mass. was awarded the contract for the 20,000 pound Snyder Monument. The bronzes on the monument: a portrait bust and panels depicting Snyder as farmer, tanner and administrator; were created by George E. Bissell, 19th century American sculptor. Snyder, a rural and virtually self educated man, rose from obscurity to serve three terms as Governor from 1808-1817. For 21st century Americans, this exhibition illustrated Snyder’s life and times in paintings, engravings, decorative arts, political prints, letters and maps. As the 200th anniversary of the War of 1812 approached, Snyder’s importance to the nation during that difficult war is of special interest. The exhibition opened at Susquehanna University’s Degenstein Theater with a presentation by Don Housley on Simon Snyder and the War of 1812. The event sponsored by the Snyder County Historical Society (SCHS) and Selinsgrove Projects, Inc.(SPI) was held to celebrate the life of Simon Snyder and raise money for renovating the monument. 1. As a young man, twenty five years old in 1784, Simon Snyder, for whom Snyder County was named, and his brother-in-law Anthony Selin, founder of Selinsgrove, became partners in a general store at Selinsgrove. In his article, “The County Store of Half a Century Ago,” William A. Russ Jr. writes that success in running a general store depended on many qualities but three were fundamental: willingness to work hard, absolute honesty, and a shrewd business sense. He also says that the business of a country store was sometimes the stepping stone to political office for its proprietor. This was true for Simon Snyder. In 1785 he was elected/appointed Justice of the Peace and by 1789 was appointed one of two representatives the County (Northumberland) sent to the State Constitutional Convention. “The Country Store of Half a Century Ago,” Pennsylvania History, Vol. 17, No. 3 (July, 1950), pp. 208-214, Penn State University Press. 2. An indenture (contract) for land Simon Snyder and his wife Catherine sold to Nicholas Martz, Yeoman, of Penn Township, Northumberland County PA in 1798 describes the location of the property in great detail with landmarks such as a post, a White Oak, a Chestnut Oak, a Pine tree, a path etc. The indenture finally states that the property is “the greater part of a certain tract of land called Germany.” Property near Spotsylvania VA was called “Germanna” and there is a township in Adams County PA called “Germany” but we are still looking for another reference to property in Penn Township called “Germany”. Other property owners mentioned are John Thomas, Jacob Giltney and Daniel Stimley. Geo. Kramer and Fred. Evans witnessed the signing. The property sold for fifty pounds of lawful money of the State of Pennsylvania. 3. A visitor asked where the Thomas Sully portrait of Simon Snyder is today. The Snyder exhibition team was not able to locate the Sully portrait. The Smithsonian Institution Research Information System (SIRIS) Art Inventories database lists it as owned by Albert Rosenthal, Philadelphia, Pennsylvania but none of our contacts was able to tell us where the painting is currently located. Another visitor asked which Peale painted the portrait hung on the title wall of the exhibition. It was painted by Charles Willson Peale. 4. A Pennsylvania rifle made by John Parks Sr. in Selinsgrove around 1810 is one of the items displayed at the Snyder exhibition. John Parks Sr. and Jr. made rifles. They were more commonly called Kentucky rifles. 8. John Blair Lynn wrote in his “Annals of Buffalo Valley” that Simon Snyder, Esquire of Selinsgrove was married to Catherine, daughter of Colonel Frederick Antes, of Northumberland on Sunday evening, June 12, 1796. They are said to have lived in Snyder’s home on Water Street in Selinsgrove. He was a 37 year old widower with two children, Amelia and John. Catherine was 19 years old. Both Simon and Catherine had been baptized in the Moravian church as infants. 10. While Snyder was governor the legislature sold Independence Hall to the City of Philadelphia for $70,000 to raise money to build a new capitol in Harrisburg. They had earlier sold the furniture used in Lancaster to help meet the expenses of repairing the Dauphin County Courthouse, the interim Capitol building in Harrisburg.